Shajidah, a Rohingya teen, shares the story of her harrowing escape from Myanmar. Channel NewsAsia’s Get Real documentary tracks the journey of a group of Rohingya refugees as they flee persecution in Myanmar in hopes of a better life, only to face a fate much worse than they could imagine. ACEH: Life in Myanmar for Shajidah was more than a 16-year-old should live through. There, she faced a terrible dilemma: To stay and live in fear or to leave and risk her life. Back in her village in the state of Rakhine, it was safer for Shajidah to sleep in the jungle than in her own home. Myanmar maintains the Rohingya are illegal immigrants from Bangladesh, and denies them citizenship, healthcare, education and other basic rights. Shajidah and her Rohingya community have been displaced by communal violence and clashes in Myanmar’s Rakhine state which has forced hundreds of thousands of them from their homes into squalid camps. In the hopes of giving his daughter a better life, Shajidah’s father decided that she should join her brother, who had already fled to Malaysia. But first, she had to get through the journey there. Without passports and freedom of movement, her family had to pay a smuggler to get her out of Myanmar. After days hiding out at the smuggler’s village, Shajidah spent the next three days being transferred to two different boats and eventually, onto a ship that was so crowded, nobody could sit. “They gave water three times a day. At 7am, noon and 4pm. After that time, if anyone asked for water, they would get beaten. If anyone asked why there was insufficient food, they would get beaten. Nobody could say anything,” she said. Things became worse when the captain suddenly abandoned the ship. None of the passengers could operate a ship as they drifted on the open sea. Yet, when they encountered navies from Malaysia and Indonesia, Shajidah claimed they were pushed away despite insufficient food on board. 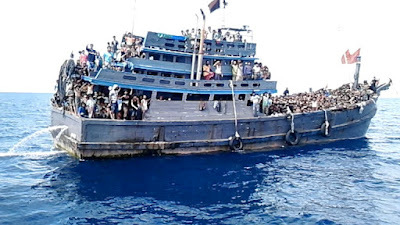 Only when the ship sank in Indonesian waters near Aceh, forcing its passengers to jump into the sea, were they rescued by fishermen. She and others were then taken to a refugee camp in Aceh, Indonesia, where she remains today. Shajidah is one of the luckier refugees who has survived the convoluted and most times violent journeys to freedom. Many like her leave Myanmar with hopes of getting to Malaysia, only to be side-lined on the Thai-Malaysian border where more ransom is asked of them. In Shajidah’s case, it was a “freedom boat” to nowhere. In May, unmarked graves full of broken bodies were uncovered in Songkhla, Thailand, near the Malaysian border. Forensic tests indicated that the dead were ethnic Rohingya Muslims who had died from starvation or torture. Further investigations revealed they had been held against their will at detention camps and tortured until their relatives paid a ransom. According to an informant who wanted to be known only as Hamid, some people died even before they reached the camps. Malnourished and ill, some died on the ships while others died on the gruelling five-hour trek to the camps. Another 16-year-old Rohingya, Amin, survived to tell the tale of his horrific experience at one of these detention camps. Roshid, on the other hand, endured a longer journey when he was promised freedom in Malaysia only to be sold as a slave, first to a rubber plantation in Thailand, then to Thai fishermen. For four years, he was trapped on a fishing boat, forced to work 18 hours a day with no rest and no pay. “We were sold many times like animals and cattle. I felt so sorry for myself on the boat. I kept thinking about how to escape. But I could only think about it. Life was very sad for us,” he said. Refugees at a camp in Aceh, Indonesia. In spite of the efforts by police in Thailand and Malaysia to crackdown on criminal syndicates, human trafficking remains big business in Southeast Asia. “There is a large pool of very desperate people seeking asylum. In the eyes of human trafficking syndicates, that spells financial gain,” said Mr Matthew Smith, co-founder of Fortify Rights, a non-profit human rights organisation. He believes the government of Myanmar holds the key to reducing trafficking. “If the government of Myanmar stops depriving Rohingya of adequate aid, stops using people for forced labour, and addresses the issue of statelessness, then we will see a dramatic decrease in human trafficking in Southeast Asia,” said Mr Smith. Rohingya flee Myanmar by sea in overcrowded boats. But where there is demand, there will be supply no matter the regulations, said Ms Aegile Fernandez, co- director of Tenaganita, a non-governmental organisation protecting and promoting the rights of women, migrants and refugees. As such, companies who are in need of cheap labour are partly to blame. “There’s a demand in Malaysia for labour. And therefore we bypass all the rules and regulations set in place for the recruitment of workers,” said Ms Fernandez. According to her, it is most likely smaller companies that hire just five to 10 workers in industries that may fall under the radar of law enforcement, such as furniture manufacturers, automobile workshops or restaurants. “You know that you can have these undocumented workers but they can be hidden,” said Ms Fernandez. For Shajidah, despite the gruelling two-month ordeal, she still harbours hopes of going to Malaysia to be reunited with her brother. Listen to the stories or Myanmar’s Rohingya refugees, follow their trail and learn about the fight against human trafficking on Get Real: Shallow Graves, Nov 3, 8pm (SG/HK) on Channel NewsAsia. You can also watch web-exclusive footage from the documentary series at Channel NewsAsia Connect’s YouTube page.